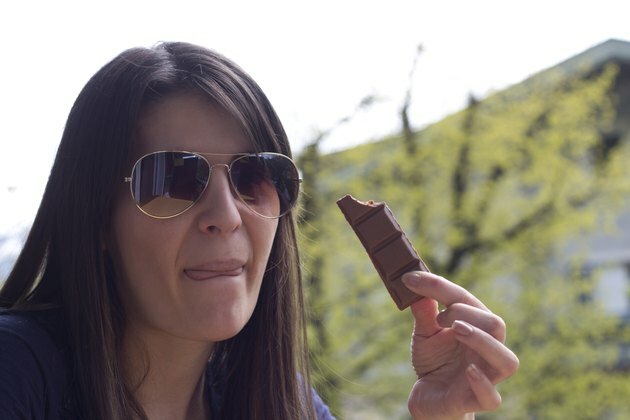 Sores that develop on your tongue after eating chocolate are most likely related to an allergic reaction. Canker sores are the most common type of sores that can form from a chocolate allergy. Other common allergic rashes include hives and atopic dermatitis. Chocolate may contain one or more highly allergic foods, such as milk, soy, tree nuts, peanuts or wheat that can trigger an allergic reaction, according to the University of Maryland Medical Center. You might also have an allergy to cocoa beans, the main ingredient in all chocolate products. Canker sores may be the result of a food allergy, including an allergy to chocolate. Canker sores are small, shallow sores that develop on soft tissue, such as on your tongue, inner lip and gums. These sores can become very painful, causing you to avoid eating and talking. They are commonly rounded or oval and are identified by a yellow center and a red border. They can cause tingling and itching. Canker sores typically go away within one to two weeks. If the sores continue longer than two weeks, make an appointment with your doctor or dentist. Hives are a common skin reaction from a food allergy. The American Academy of Allergy, Asthma and Immunology states that hives can develop anywhere on the body and are raised, red welts. Hives do not pose any threat of further complications, unless they form in your throat. Hives in the throat can cause your airways to become blocked, restricting your ability to breathe. If you suspect that hives are the rash that is forming on your tongue, call your doctor. Hives may be a sign of a severe allergic reaction. Contact atopic dermatitis is an allergic reaction that occurs on the skin where your skin comes into direct contact with a certain substance. This allergy condition will cause sores to develop anywhere where chocolate touches your skin. Allergic contact dermatitis can cause pimple-like blisters to form on your tongue and in your mouth that are extremely itchy and can cause scaring if not properly treated. If you're allergic to chocolate or one or more of the ingredients in the chocolate product, you may develop other symptoms, such as wheezing, nausea, diarrhea, vomiting, skin rashes, nasal congestion and a rapid pulse, according to the University of Maryland Medical Center.